The Telr OpenCart Extension allows merchants who use the OpenCart system to take payments via the Telr Hosted Payment Pages. No card details are captured by or stored within the OpenCart system, so there are no PCI requirements for the store. You must have PHP version 5.5 or later, and the cURL PHP library must be installed and enabled. Click here to download the OpenCart 2.3.x plugin or click here to download the OpenCart 3.x.x plugin. Transfer this to the server that is running your OpenCart store.This contains two components. These are the items used for the store when it catalogue mode (when a customer is making a purchase) and for when the system is in admin mode. The contents of the catalog directory from the zip file should be copied into the catalog directory from your store. The contents of the admin directory from the zip file should be copied into the admin directory from your store. You may have renamed the admin directory as part of your original OpenCart installation process, so you should ensure that this is copied to the correct location. Once the files have been copied to the correct place, you should log in to the OpenCart administration system to configure the payment module. From the Administration System, select Payments from the Extensions menu. This will present you with a list of available payment methods. Locate the entry for Telr and click on the plus icon in order to enable it. You then need to edit the settings for the payment method. 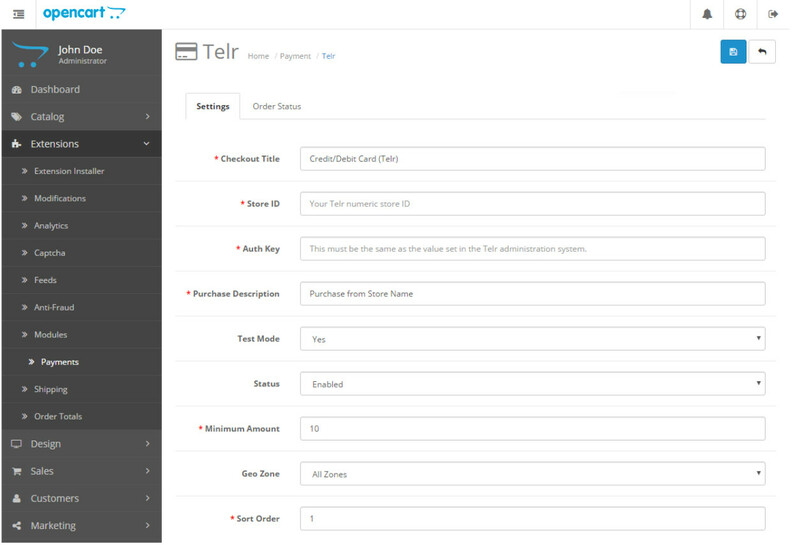 Your Telr Store ID is displayed in the top right of the Telr Merchant Administration System. The authentication key can be found in Telr Merchant Administration System in Hosted Payment Page V2 configuration page, under the Integrations menu. The Order Status section allows you to set which status values are used when creating or updating the order within OpenCart based on the transaction results. When you are ready to start processing live transactions, you must ensure that the IP details of your OpenCart server have been entered into the Payment Page V2 configuration with the Telr Merchant Administration System.